They were in the westbound lanes of I-40, a few miles east of Memphis, when a black police SUV with flashing lights pulled them over, Jonas-Boggioni said. A second black SUV soon pulled up behind the first one. "Knowing I wasn't speeding, I couldn't imagine why," she said. Two officers approached, one on each side of the car. "They were very serious," she said. "They had the body armor and the guns." Because the couple's two schnauzers were barking furiously, one of the officers had Jonas-Boggioni exit the car so he could hear her better. "What are you doing with a marijuana sticker on your bumper?" he asked her. 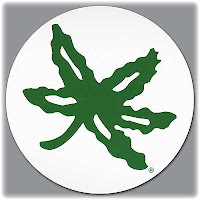 She explained that it is actually a Buckeye leaf decal, just like the ones that Ohio State players are given to put on their helmets to mark good plays. "He looked at me like I was speaking a foreign language," she said. At that point, Boggioni got out of the car to show that he was wearing a commemorative sweatshirt from the 2002 national-championship season, complete with a Buckeye leaf. The officer then explained that someone from outside his jurisdiction — apparently another officer — had spotted the leaf sticker and thought it might indicate that the car was carrying marijuana, Jonas-Boggioni said. On the left, a marijuana leaf. 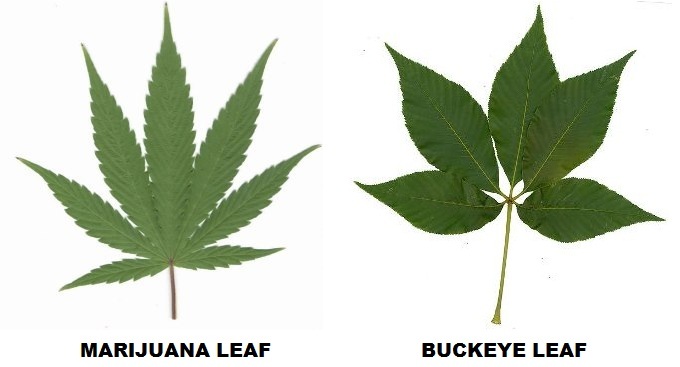 On the right, what Tennessee cops think is a marijuana leaf. I realize that being a cop is stressful. With countless government regulations to enforce and growing ticket quotas to fill, it's quite understandable that some among the ranks of our uniformed protectors would start looking for just about any reason to pull someone over. But a sticker that sort of looks like a marijuana leaf? Really? What would have made more sense was to pull Bonnie and Guido over for displaying a Big Ten sticker in SEC country. After all, isn't that a more serious offense than smuggling marijuana? You're a man. Time to start smelling like one.